I wasn’t upset by his first comment because I’ve seen and heard this before. A child is unsure of singing or an activity in class but within minutes, even moments, they are joyfully playing along with their peers. I’ve also seen kids who stay extremely close to mom during their first class steadily gain confidence and bravery as they begin to play instruments or do movement more independently each time they attend. I’ve talked with parents who tell stories of their shy little one singing WeJoySing songs “all the time” at home, while in class, they prefer to observe. 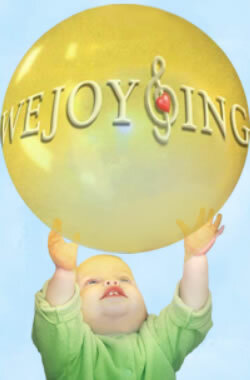 One of the most beautiful aspects of WeJoySing is that the entire 30-minute class is a playful environment for the children. During class, they are enjoying the story line being told with each activity and they are eager to get to play a part in the story. The children are doing what comes so naturally to them which is playing. And, another beautiful thing is that they have no idea how much they are learning about music, language, social skills, math and so much more. In this video, Landry and Dempsey are learning “expressive speech and the foundations of "sing! "...Yep, it sure doesn't sound like singing though. However, they are exploring ALL the PITCH POSSIBILITIES in their voices! This is the first step to in-tune singing. Research indicates that in order to SING one must be able to explore all the different pitches available in your voice. Not only have I witnessed the fun other children have while I’m teaching, but I’ve seen it with my own boys. I love hearing my boys enthusiastic, “yes!” when I ask if they are excited to go to music class. They practically run towards the building once they are released, yes released, from their seat belts…parents of toddlers, I know you understand. What a joy it was to go to our first class this fall, after a summer break, and see both of my boys smiling, singing and dancing, “the more we get together…” as if we had been doing it every day since Spring. It is important to note however, that while we have a lot of fun in each WeJoySing class, there is also an incredible amount of learning and growth happening for each child. The curriculum is loaded with fun and developmentally appropriate activities that teach music, language, math, social, listening and even physical skills. 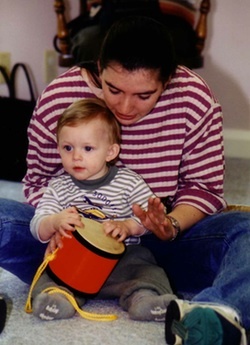 Children learn how to keep a steady beat which helps develop their language and reading abilities. They joyfully learn to listen to instructions, stories, and music. They will learn spacial awareness and physical movements while dancing and moving around the room. They will learn how to help clean up and take turns. Parents will see their children growing and learning these skills but the children are simply doing what they love best, PLAYING!!! While teaching, I truly hope each child learns, grows and develops these various skills. I love that music makes learning FUN! Oh, if you were wondering about the child “who doesn’t like to sing”…well, as we continued class and got to our first movement exploration song, “Come children, let us go…put on your running shoes,” I looked over and saw this student moving all around the room with the biggest grin on his face. Joyfully Singing on My Way! !